Britain’s police watchdog says more than 2,400 police officers could be investigated over the 1989 Hillsborough stadium disaster, in which more than 90 football fans died. 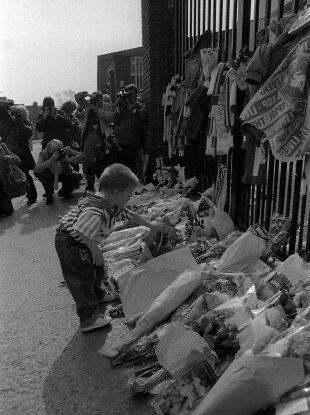 A boy adds a floral tribute at Anfield's Shankly Gates in remembrance of those who lost their lives. MORE THAN 2,400 police officers could be investigated over the 1989 Hillsborough stadium disaster, which killed more than 90 football fans, Britain’s police watchdog said Tuesday. The actions of 1,444 members of South Yorkshire Police are already being scrutinised, but the Independent Police Complaints Commission (IPCC) on Tuesday told a parliamentary committee that up to 1,000 other officers could be investigated. The list includes officers from around 20 other forces who were present at the disaster. An independent inquiry published in September exposed a police cover-up in the aftermath of the crush at the 1989 FA Cup football semi-final in Sheffield, northern England, that killed 96 Liverpool football fans. Email “2,400 police could be probed over Hillsborough disaster”. Feedback on “2,400 police could be probed over Hillsborough disaster”.